What’s Up With The Ants? Attention entomologists: The ants in my kitchen are exhibiting strange behavior. Here’s how I discovered it. A few months ago I bought a coffee pot cleverly designed to make one cup at a time. I was intrigued by the television sales pitch, purchased it from the shopping channel, and for several idyllic months brewed my convenient java-for-one without incident. Then one morning I noticed that the gadget was a little sluggish and not all the water was getting through the coffee filter into the cup. I opened the reservoir and made a horrifying discovery: hundreds of ants floating in the water. 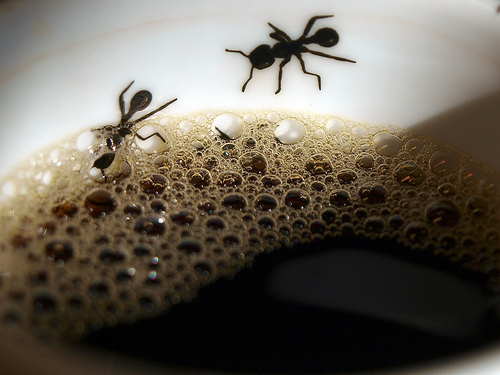 In the coming days I noticed a steady stream of ants marching single file into the coffee maker. I saw them scurrying around the grains of coffee in the filter, gathering at the edge of the reservoir, skittering on top of the spilled drops of coffee on the tray. I realized grimly that the reason my coffee maker no longer worked was that it was clogged with thousands of swarming or dead ants, and that there was a line of the doomed critters from the pot clear out to my garden. OK, I am not a scientist but I feel quite comfortable saying that I know something about ants. Over my lifetime I have acquired some field experience with the species, especially with their eating habits. I have observed, for instance, that ants like sweets and meats: a glob of honey or a spoonful of stew on the counter brings a million ants whereas, say, a jar of cream of tartar or a bunch of parsley do not. Moreover, in decades of coffee brewing and drinking I have never noticed a single ant taking any interest in a cup of bitter unsweetened java. Like I said, I am no entomologist. I have read a small amount about the tireless dedication, discipline and great strength of the female worker ants. I know that ants live in a highly structured society under the governance of a huge Queen who is fed by the working girls and fertilized by male ants who lounge around the colony and die shortly after mating. Now it seems some force in the ant world is raising the bar and driving these poor beleaguered underlings to a caffeine-addicted lifestyle. Could the Queen be giving orders for the ants to go to my kitchen coffee house and fuel up? Are they falling behind on their work quotas? Do they need a chemical kick in the exoskeleton? Maybe the desperate insects have developed a taste for caffeine. Perchance they find they can work harder after ingesting some microscopic portion of Sulawesi at my brewing station. They are willing to line up for yards, risk their lives on the perilous coffee tray and face an even greater chance of extermination while trapped inside the percolator. Whatever is causing this storm to brew, the whole grisly picture makes my heart weep for my poor ant sisters. Perhaps it is because they appear to be acting out in miniature our own senseless, scurrying human lives, fueled by too much pressure and caffeine. I think I will probably retire my nifty new coffee pot in favor of a simpler one that is better barricaded against the ants and their possible caffeine addiction. I refuse to be an ant enabler. Did you grow up with siblings? Remember when Mom or Dad broke up a fight? How about the finger pointing and choruses of “He started it,” “Noooooooo…SHE did. NO FAIR!” Or maybe you discovered the blame game in the schoolyard or on the playing field. Small wonder that as adults we find it hard to take responsibility for our actions in a relationship. Who wants to be the bad guy? Who wants to take the blame? Who wants a time out? The good news is that there is a big difference between taking blame and accepting responsibility. Blame means being shamed and scolded by another person. Responsibility means holding yourself accountable for your own actions. Blame leaves you feeling weak, while taking responsibility strengthens you. One of the most difficult lessons I have had to learn as an adult is that accepting responsibility for one’s actions doesn’t mean a punishing trip to the principal’s office or a lonely weekend of grounding. Owning up, apologizing and offering compensation lead you out of trouble, not into it. Clearly I had not learned the difference between taking responsibility and blaming. I was angry because I thought the book was telling me that I had to blame, shame and punish myself. Actually, the advice was just the opposite. The epiphany that arrived at last is that when recovery gurus talk about taking responsibility, they are talking about looking out for yourself. Taking responsibility doesn’t mean beating up on yourself. It means recognizing the part you play, which is the part you can change in order to take care of and protect yourself. Taking responsibility gives you the power to change the things you can–a core precept of the Alcoholics Anonymous program. When you blame, you let out your anger, but beyond that you leave yourself in the role of a helpless victim. If it is HIS fault then you are at HIS mercy. Only he can make things better. There are other benefits to taking responsibility for your actions. If you apologize for being wrong, you alleviate feelings of guilt. If you don’t admit when you are wrong, you open yourself up to all sorts of negative feelings from the other person and from within. If you apologize for the mistakes you have made you will feel good about yourself no matter what the other person says or does. Best of all, because you are a grownup, there won’t be any parents, or hall monitors, to scold you. You won’t miss your dinner or be sent to a corner for a time out. You will feel like an adult, and a sane one at that.